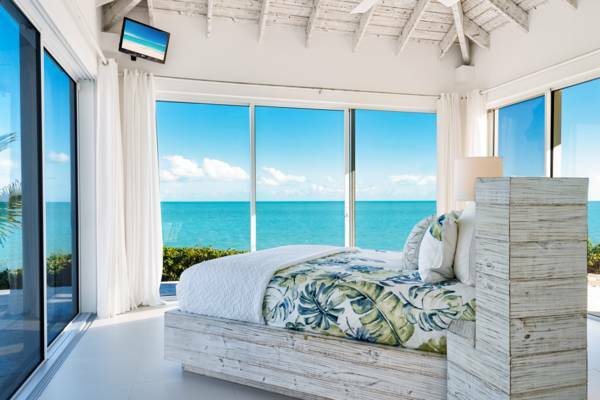 Discover true island paradise and relaxation at Breezy Villa – where every window faces the ocean! 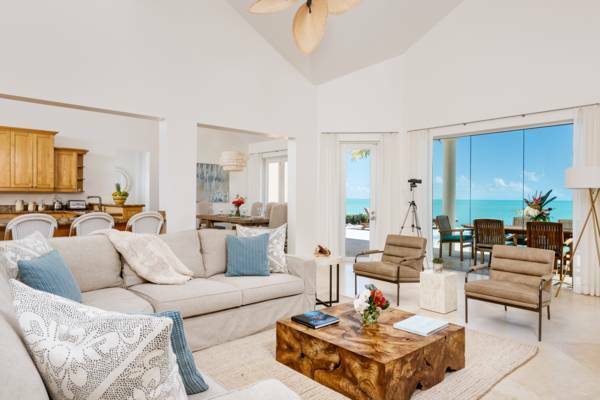 This stunning, contemporary, private ocean-front villa, situated on the south shore of Providenciales’, is perched atop Long Bay’s turquoise shore. 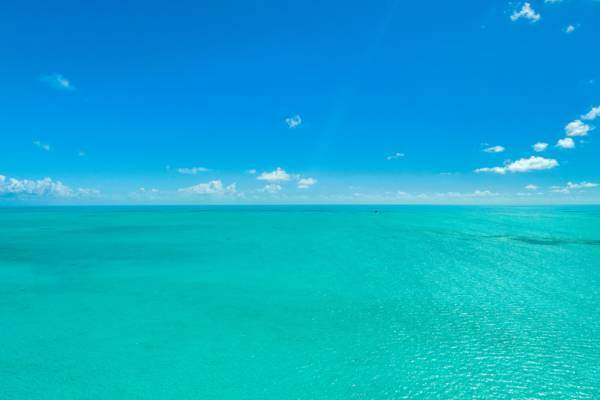 Enjoy the beautiful breeze while you take in the unforgettable views of the breathtaking turquoise Atlantic ocean. 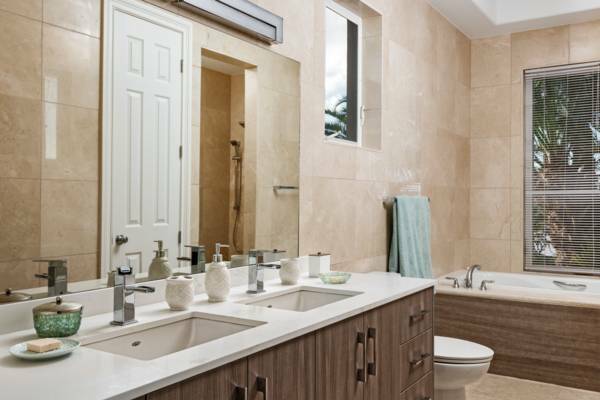 Breezy Villa was recently renovated and updated and we know you will enjoy the modern, coastal design and décor that is both relaxing and refined. And we really mean it – every window faces the ocean! Starting with the open concept, large vaulted ceiling living room with a plenty of cozy seating and an entertainment center that boasts a 65” 4K Ultra HD Smart TV and a Sonos surround sound system – relax and take in the views or chill and have a glass of wine and a Netflix movie. The living room opens to a dining room that is fitted with a large, 8-person dining table where you and your family, or guests, can enjoy meals while surrounded by turquoise waters. 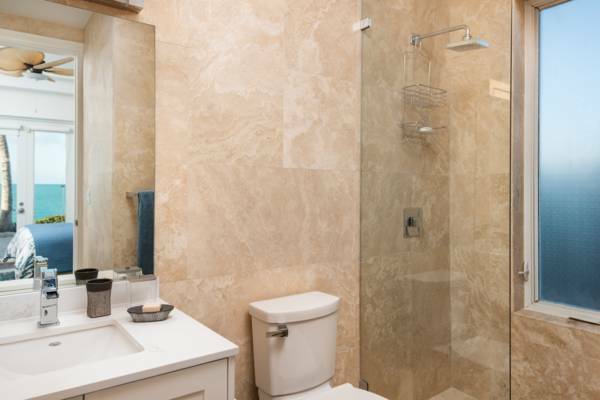 The villa’s gourmet kitchen is fully equipped with everything a chef would need including state-of-the-art appliances, gorgeous tableware, cutlery, serving dishes and more. If you prefer to dine "alfresco" under the stars, then head outside to the large, covered, outdoor dining and entertaining area. 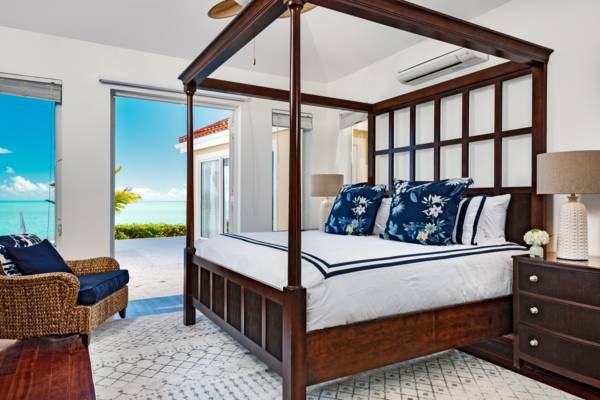 Every guest will feel like a superstar when they retreat to any one of the four stunning bedrooms, all equipped with en-suite bathrooms, and all with large French doors that open to the incredible ocean views. 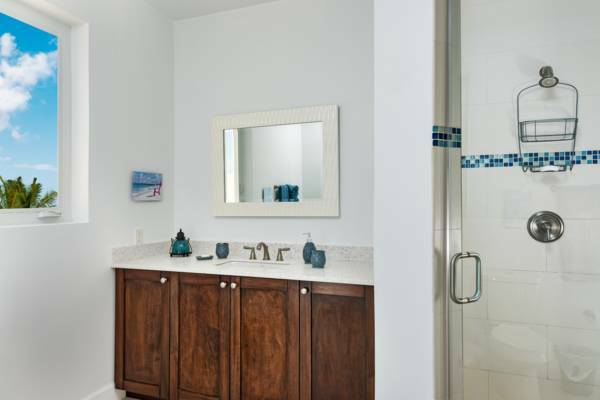 Each room is uniquely and elegantly decorated in modern coastal décor, fine linens and plenty of space to store your belongings. The master bedroom has a gorgeous King-size canopy bed with an en-suite bathroom fitted with double vanities, a tub and a large walk-in shower. 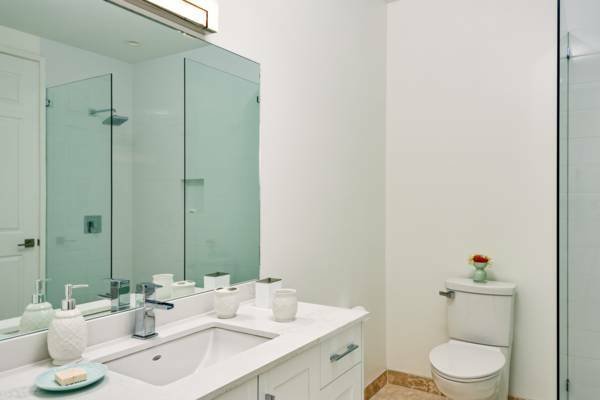 The second guest room is equipped with two Twin beds (or if you prefer, can be combined to form a King) has a beautifully updated bright bathroom with walk-in glass shower and large vanity. 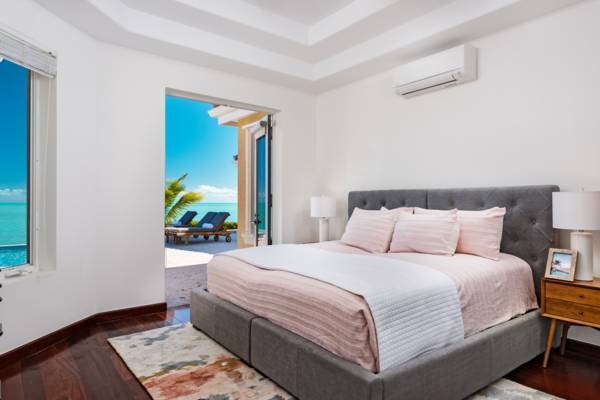 The third bedroom features a gorgeous, Queen size, Williams & Sonoma bed with modern island accents and décor as well as an en-suite with walk-in shower. One of the most stunning rooms in the house might be the open-air, stand-alone guest house that sits next to the pool. 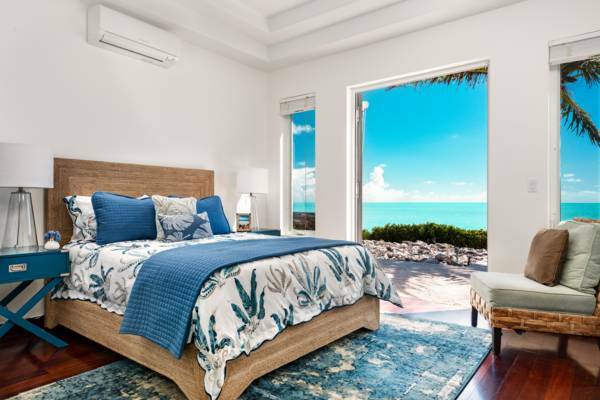 Featuring a Queen size bed, full en-suite bathroom, this bedroom has wrap around sliding glass pocket doors that open up on all sides to let you feel the ocean breezes and make you feel like you are perched on top of the turquoise ocean. 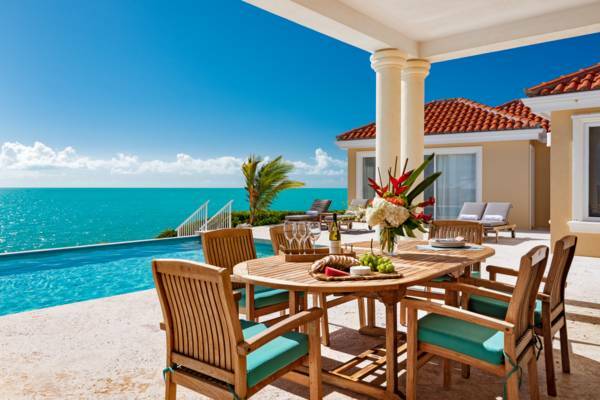 Step outside to Breezy Villa’s patio and you will find a huge, infinity pool along with plenty of lounge chairs for you to lie out and soak up the sun. Adding to this incredible oasis are beautiful trade winds that provide a soothing breeze to cool you on a hot day. Outdoor dining is available under the covered patio equipped with large teak dining table, chairs and a BBQ. 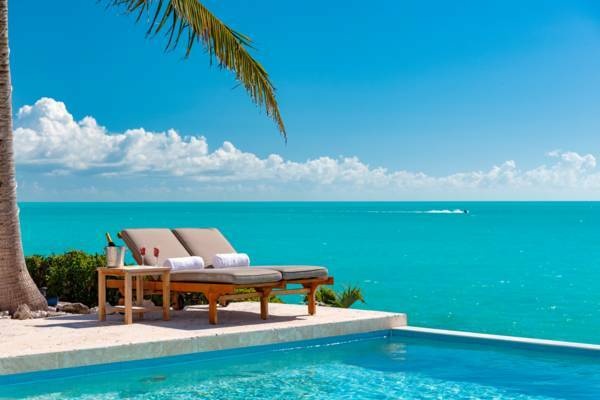 Take a dozen steps down to a beautiful swim deck that is perched over the turquoise ocean. 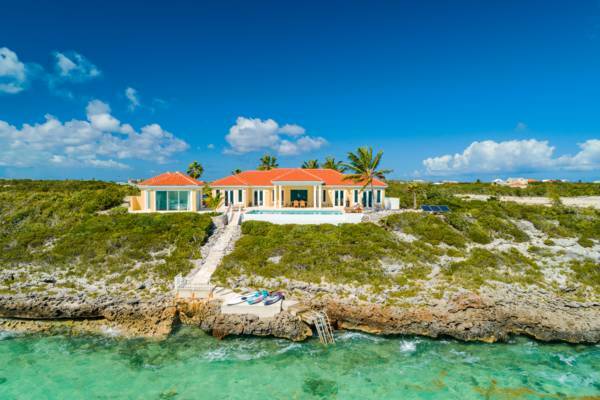 And only a handful steps down the swim ladder, you will find incredibly warm, inviting ocean, white sand in your toes, and depths not higher than your chest – making lounging and floating in the ocean ideal. 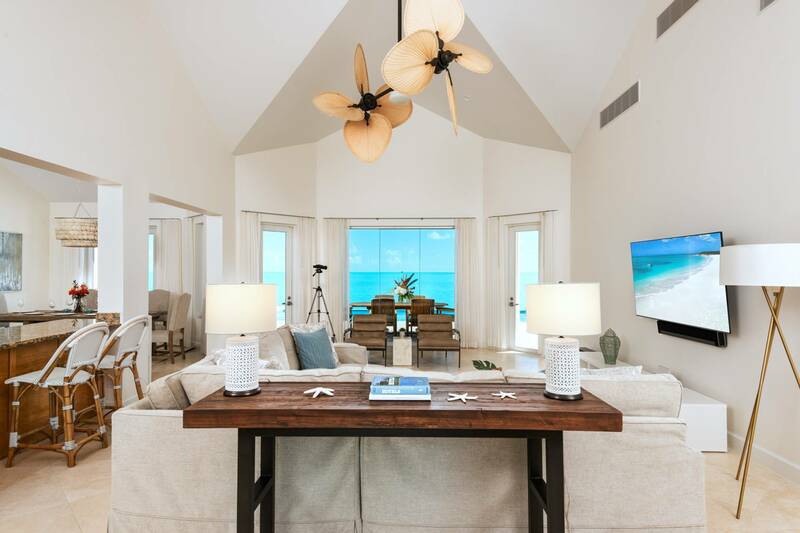 If you prefer more activity and adventure, the Villa is equipped with two paddle boards and two kayaks for you to explore the shores of Turks & Caicos. Preferable weekend to weekend stays, a minimum of 5 days would be considered at a prorated basis. Beautiful! It was amazing! The view was breathtaking. it was very private and so nice to be on the ocean. Can't wait to go back! Great villa for vacation we will be back!!! Breezy Villa was a great vacation it had everything we needed and a short drive to the grocery store and beaches. We had a breezy everyday which is very nice if you are in the sun but don't forget your sunscreen or you can burn very easy with out even knowing it. The pool was a little cool in the morning, by afternoon it warmed up. I would recommend this villa if you want to be close to everything and still have some privacy. I also want to mention the property management team was great it is important to have that when you are away they helped us with anything we needed.